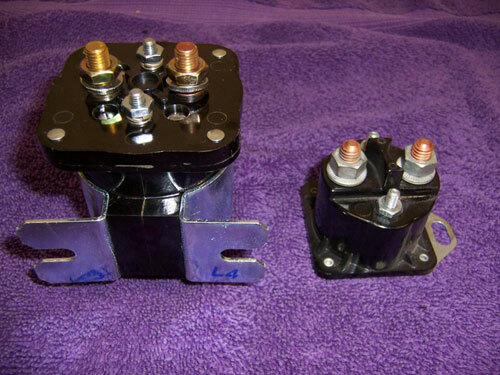 Aftermarket Glow Plug Module originally manufactured for large sound studio amplifier applications. Coil is rated 12 volt continuous duty. Contact rating 200 amp continuous, 600 amp inrush. If you are looking for a replacement GPR that will last much longer and do a much better job of delivering full voltage to the glow plugs when you need it the most, this is the relay you are looking for. The relay bracket will fit the existing GPR bracket bolt spacing. Warning: When tightening the small terminal lugs, only tighten enough to seat the nut on the lock washer. If the lug is overtightened, the lug will shear off. Broken terminals will not be waranteed. • Contact Terminal: 60 inch-lbs. max. • Coil Terminal: 12-18 inch-lbs. max. Click on this link for a writeup from my Mods and Maintenance Pages from when I installed the 586-902 relay on my personal vehicle more than 6 years ago and it is still working as well as the day I installed it.